Steven Mnuchin will have to get his own finances in order before he can focus on the nation’s. U.S. President-elect Donald Trump’s choice to head the Treasury Department has made millions on Wall Street. Unlike his new boss, Mnuchin will have to produce his tax returns to win congressional approval, a step that has tripped up past nominees. The Senate Finance Committee will ask Mnuchin to submit his last three tax returns and answer questions about his finances, as is customary for nominees for the post. The panel is known for its tough scrutiny, particularly on the use of tax loopholes such as carried interest, business deductions and breaks for real-estate investments. If there are any issues, the committee could ask for returns for the last 10 years. Mnuchin’s net worth is unclear but substantial. He’s estimated to have made some $40 million during his 17 years at Goldman Sachs. After leaving the firm in 2002, he helped finance blockbuster movies like “Avatar.” His hedge fund, Dune Capital, was also one of the investors that acquired failed lender IndyMac in 2009 for $1.6 billion. The bank was sold to CIT Group in 2014 for $3.4 billion. Other financiers seeking top Treasury jobs have faced challenges. The current secretary, Jack Lew, previously worked at Citigroup and was grilled by senators about an investment in one of the bank’s funds based in the Cayman Islands, known as an offshore tax haven. In 2013, then Morgan Stanley finance chief Ruth Porat chose to avoid the scrutiny by withdrawing her name from the running for deputy Treasury secretary. It hasn’t been easy for non-wealthy nominees, either. Tim Geithner, President Barack Obama’s first Treasury secretary, apologized to the Senate in 2009 for what he called a careless mistake on his taxes after disclosing he had failed to pay more than $34,000 in Social Security and Medicare taxes from 2001 to 2003, when he worked at the International Monetary Fund. It’s no small irony that the American public will learn more about Mnuchin’s finances than Trump’s since the real-estate mogul declined to release his tax returns. It may be worth Mnuchin spending as much time with his accountant as he is with the president-elect. 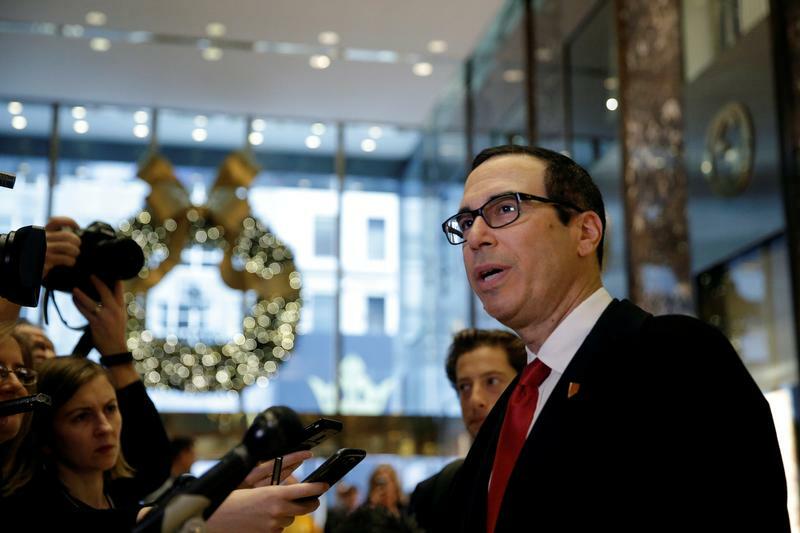 U.S. President-elect Donald Trump said on Nov. 30 that he had chosen Steven Mnuchin as his nominee for Treasury secretary. Mnuchin, who served as Trump's campaign finance chairman, spent 17 years at Goldman Sachs, then set up his own hedge fund, Dune Capital, which financed the Hollywood blockbuster "Avatar." Mnuchin also was part of a consortium of investors who in 2009 bought many of the assets of IndyMac, the mortgage lender that went bankrupt a year earlier. He and his fellow investors agreed to sell the bank to CIT Group in 2014 for $3.4 billion. As part of his U.S. Senate confirmation process, Mnuchin will be asked to submit three years of tax returns, as is tradition because the Treasury supervises the Internal Revenue Service. The process will be overseen by the Senate Finance Committee, which will hold a hearing on his nomination. "Given the depth and breadth of Steven's private sector experience, he will play a pivotal role in bicameral efforts to revamp the nation's outdated tax code to create a healthier economic environment for American businesses and families here at home," Senate Finance Chairman Orrin Hatch said in a statement.